How are we as Christians to understand the Lord’s Supper? What, if anything, happens when we receive the bread and cup? 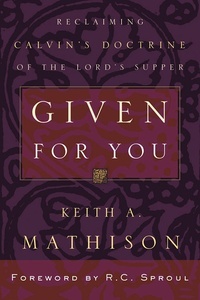 In Given for You, Dr. Keith A. Mathison addresses these and other questions as he introduces, explains, and defends a Biblical understanding of Holy Communion.